City Cat Clinic. Exclusively for Cats. 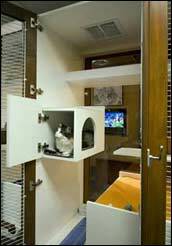 Luxury Boarding for City Cats! 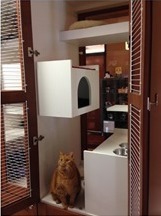 City Cat Clinic & Condos has 25 private, luxurious condominiums for your cat's boarding needs. The rate is $29.50 per night/per cat. There is an additional cost if your cats need daily or twice daily medication or supplements. 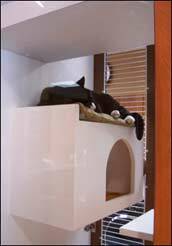 Condo boarding available for cats staying three nights or more. Cats needing a shorter stay (1-2 nights) will board in our hospital ward. Diabetic boarding is available for current clients only. Please contact the clinic for more information and pricing. We require your cat to have a current rabies vaccine (administered at least two weeks prior to your cat’s stay). Please have vaccine proof sent to the clinic before your cat’s boarding stay. Drop-off and pick-up appointments available Monday-Friday (morning between 8:00-10:00 or afternoon between 3:00-5:00) or Saturday (morning between 8:00-10:00). There are no drop-off or pick-up times on Saturday afternoon or Sunday. Any cat with a reservation will be charged one day of boarding per cat if the reservation is cancelled. We will charge your credit card $29.50 per cat when making a boarding reservation. The deposit will be applied to your boarding stay or used in the event of cancellation. We accept Visa, MasterCard, Discover, Amex or debit cards. We do not accept checks. All boarding stays need to be paid upon arrival. If additional charges are incurred during your cat's boarding stay, payment will be accepted at the end of the stay.